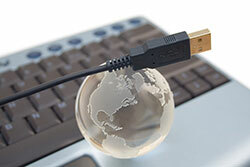 The world is getting smaller all the time for those who deal with issues of information technology (IT) in government. GSA’s long-standing relationships with high-level government IT officials in other countries are becoming more and more useful to the smooth functioning of government. With the widespread use of the Internet to conduct government business, IT concerns are no longer limited to local systems—they are increasingly international in scope. Joint work to establish standard vocabularies on the Open Government Platform (OGPL), itself a product of collaboration between the government of India and Data.gov in the U.S. The OGPL promotes government transparency, citizen engagement and economic growth by opening up government data around the world and making it available for re-use by developers, analysts, media and academics to create new applications, insights and products that will benefit everyone. Sharing ideas and experiences in developing international standards for identity management and authentication to sign on to government programs. A variety of information-sharing systems using the National Information Exchange Model (NIEM), a common information-sharing model, among all three nations. These include exchanging law enforcement information and facilitating tri-lateral sharing of Public Health Alerts, which could have a powerful impact on public health and safety across the continent. When they met in late February, the North American Day group agreed to collaborate on other issues that affect them all. These include top-priority concerns like cyber-security, interoperability, and privacy protection. They also agreed to write up a case study on open data collaboration, digital diplomacy, and acceleration of open data initiatives in each country and around the world. It would document the value of the work we’re doing together as a model of international cooperation benefitting the global community.